The key to a good video game is to make players want to keep coming back, whether it’s for an engaging story, thrilling action sequences, or simply beautiful scenery. With roguelikes, this becomes a bit more challenging: they have to tap into your sense of curiosity, leading you to wonder what you could find in the next room, and daring you to beat your personal best with every playthrough. Lost Castle appeals to your curiosity at first, but the stubbornness that fuels constant replays comes more from obligation than genuine interest. Like most roguelike titles, the story is just enough to get you in the door. A brilliant man is trying to use forces of evil to take over the world, but when he performs the ritual he’s been planning, instead of it giving him unholy power, it unlocks a portal to Hell. Demons come flooding through, taking over his castle grounds and hoarding his treasure. Adventurers from across the land hear of this event and want to test their luck in hopes of claiming the riches. You are one such adventurer, but you instantly get captured by goblins and taken to their prison. It was interesting to discover what character you’d be playing as next and figure out ways to use their abilities to your advantage. There are always more weapons to find, whether in chests or as loot from killing creatures, but your attributes are just something you have to get used to. You start out in the goblins’ mansion, which means they’ll be most of the enemies you encounter in the first section, but at least there’s some variety; you’ll see archers, spellcasters, bomb-throwers, sword-wavers, and so on. Each area introduces new types of enemies, but there are unique bosses and mini-bosses depending on where you are. 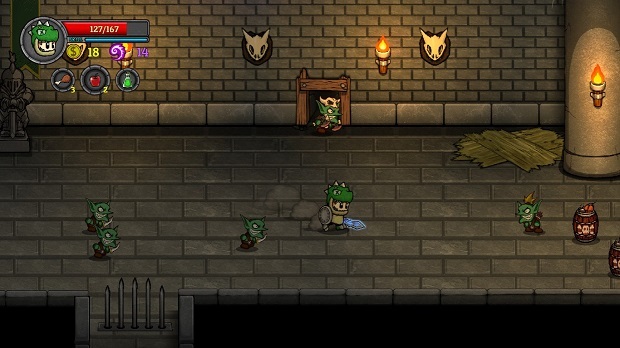 Lost Castle is what I would call a roguelike hybrid. Everything is randomly generated, of course, from room designs and groupings of monsters to goodies in treasure chests and potions. However, one element that strays from the norm is the leveling system. Instead of unlocking new playable characters as you go along, beating enemies lets you gather some of their souls. Then after you die, there’s a skill tree where you use the points from the souls to gain stat boosts or perks. While the gems you can find scattered throughout areas grant temporary attack or defense buffs, anything you earn through the skill tree is permanent. When you begin your journey, if you can’t spend all of your souls, you have to sacrifice the remainder of them. Initially this frustrated me and discouraged me from wanting to continue, but thankfully one of the perks you can buy is the ability to save some of them. The mini-bosses that appear in rooms often give you extra souls, and though they’re highly difficult, boss fights offer more souls, greater immediate rewards from chests, and the promise of new items spawning in the future. Some of the little details that have been included in this game are great, such as your character throwing apple cores or chicken bones on the ground after eating food. Any trap that can knock you off your feet or chip away at your health, like fiery floor panels, can also be turned against your enemies. You’ll have fun winding your path around, luring monsters under heavy items that fall from the ceiling or toward a stray banana peel. At the same time however, some aspects of the game feel unpolished. Lost Castle can be unforgiving, and not just because of the difficulty spikes you encounter. It constantly feels like you’re fighting the gameplay design and mechanics. For example, there’s no visual differentiation between the damage you deal and the hits you take, so getting caught up in a mob is risky because half the time you don’t realize you’re dying. Your movement is limited while in the middle of an attack combo, which makes dodging blows at that moment nearly impossible. You have to be right on top of coins to collect them, and any items that drop have to be picked up manually, creating a major hassle if you need a health item in the middle of the action. As much as I simultaneously love and hate the challenge of this game, ultimately it turns into a real grind. This is because you essentially have to die over and over again in order to beef up the skill tree and improve your chances of progressing further. By the time you reach places you’ve never seen before, you’re tired of the areas you’ve already been through. Though the rooms are randomized, the differences are minimal, with variations on wall decorations, arrangements of plants or furniture, and number or type of enemies. There are shops and special item rooms mixed in, but even those don’t bring the sense of wonder that they should. This game features local co-op right now, with online multiplayer in consideration for the future. The main thing I noticed is that adding another player greatly ramps up the difficulty. I thought it’d be easy to breeze through rooms with an extra person, but the game matches you with tougher monsters and larger groups of them. Not to mention, you also have to play from two different profiles, so the other person will be on the weaker side and die easily without a fleshed out skill tree. Controller support is unpredictable, as some work perfectly and others have to have the controls changed considerably in order for the game to be playable. Lost Castle has some addictive qualities, but those are amplified by the trick that many other roguelikes play: after you’ve spent all the souls you can, it immediately starts a new game instead of bumping you to a menu screen and letting you choose for yourself. Sometimes this keeps your momentum going and propels you forward, but sometimes you’ve just got to rage-quit and exit out. Sure, it was gratifying to feel myself growing progressively stronger with each playthrough thanks to the skill tree, but after dealing with countless goblins just for a taste of the levels beyond them, the end goal felt less and less worth the journey. If roguelikes are your cup of tea, you probably won’t find much gripe with Lost Castle. Seeing all the characters you could possibly be is enjoyable, and working through your skill tree feels rewarding, but the grind and repetition of much of the gameplay make you question whether it’s worth the hours.